Interested in decorating your trunk, participating in the chili cook off, or donating to our online auction? Download and print the form below and turn it in to your oldest student's teacher. Cars will be lined up all decorated for the kids to come by and trunk or treat! We need trunks!! Please consider signing up to decorate the TRUNK of your car, truck, van or SUV and join us for some trunk or treating! It’s a great time for the whole family to have some festive fun decorating and PRIZES will be awarded to the 3 most tricked out trunks! Candy will be provided to you to hand out, just arrive, decorate and celebrate! To help off-set the cost of candy, we are asking each child to donate a bag of candy. Please bring to class and the room-moms will take it from there! Do you always get rave reviews for your homemade Chili? If so, the Cook off is for you! Make a crockpot of your amazing Chili and see how it stands up to the competition! Winner gets Bragging rights and ribbons will be awarded for the top three winners! All you have to do is fill out the entry form, and bring your Chili in the Crockpot with a serving ladle to the school at the beginning of the festival. And we will take care of the rest! If you would like to be a part of the fun, please contact Todd Bustillo @ ​todd.bustillo@gmail.com to help out! Wouldn’t you love the opportunity to tape our new amazing principal to the wall!?!?! Annual Fall Festival Trunk or Treat! 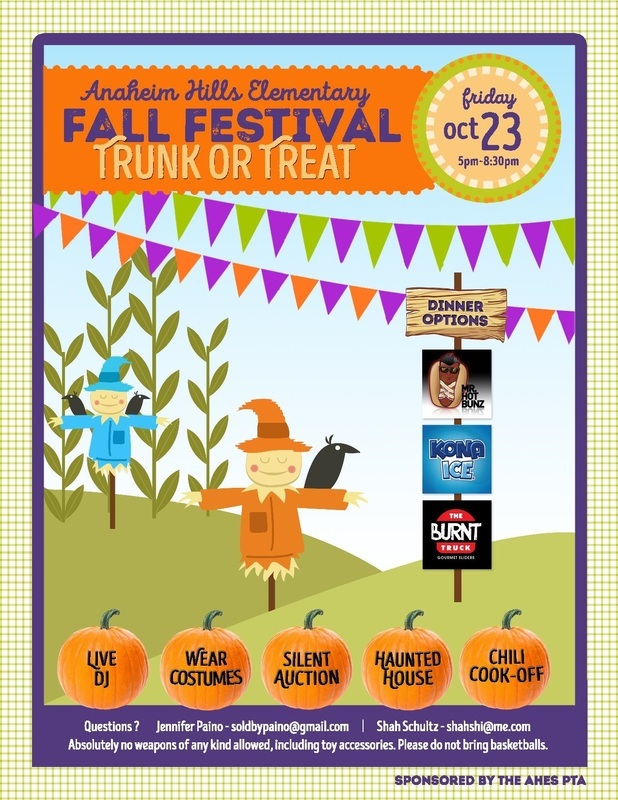 Come dressed up and ready to trunk or treat your way through the Festival as we celebrate the season! ​NO weapons of any kind allowed including toy accessories. And be sure to arrive hungry as we will have food trucks! Click here to view what you can win! And This auction is the largest fundraising potion of our event and we are hopeful for your donations! If you would like to personally or professionally donate either services, products, gift certificates to be included in the silent auction that would be wonderful. All donations are fully tax deductable. Vendors are also welcome if you would like to have space at event and donate 20% back to the PTA. Please email us to notify us of your contribution and thank you in advance for your support! If you are unable to donate, we hope you will check out the online auction as we get closer to the event and consider bidding on that perfect prize! You are welcome to email your AHES Fall Festival co-chairs with interest or questions! Due to its overwhelming success, we will be holding our Silent Auction again on-line! Bidding will be open on Monday the 12th at 5AM and will close on Fall Festival night at 7:00PM.